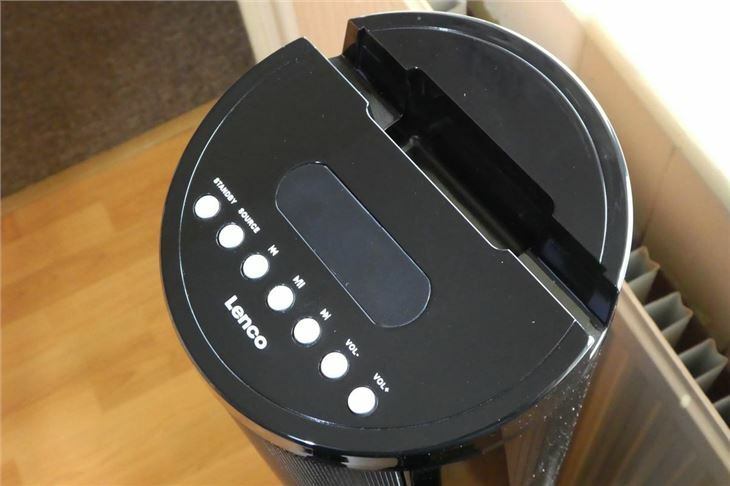 As the name suggests, the Lenco BTL-450 is a Bluetooth tower speaker. It also offers pulse LED lighting, with eight colours and three lighting modes. The hi-fi speaker features customisable bass and treble (to an extent) with the capability to play music via Bluetooth, USB connection, 3.5mm aux cable or SD card. This is the second Lenco audio product we've tested, with the Lenco L-400 turntable proving itself to be an affordable alternative to more well-known brands. 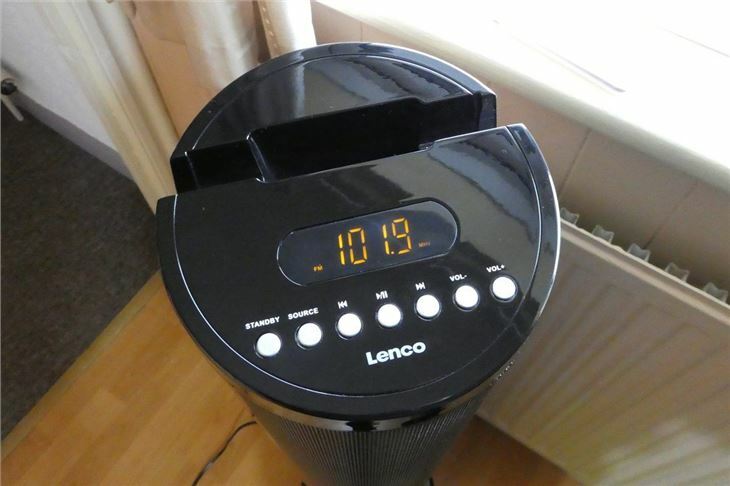 The speaker is currently £119 on Amazon, which is fairly good value - however, on Lenco's website marks the price as £149. For almost £150, does the BTL-450 stack up to more premium speaker brands? In the box with the speaker is a wooden, circular disc that needs to be attached to the bottom of the speaker to give it some stability. It's a very quick and easy job. The speaker is quite light for its size, though not that easy to move around because of its height - although we can't imagine it being moved all the much anyway. As you can see in the photos, our speaker is the black model, but the Lenco BLT-450 also comes in white. 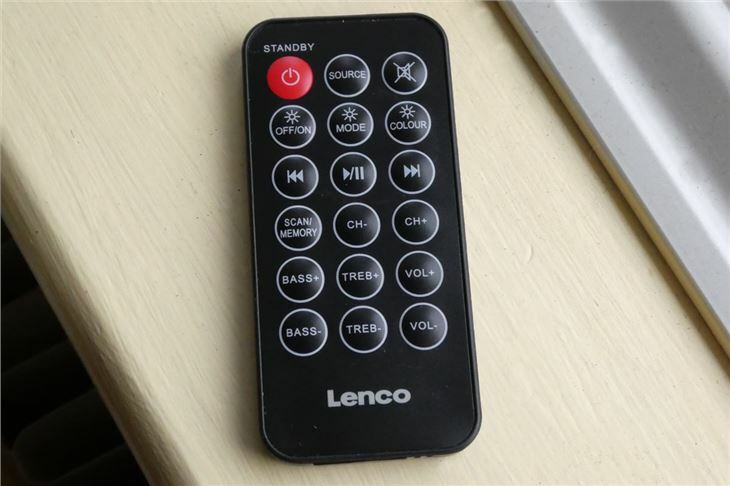 You get a small remote with the tower speaker, which can be used to turn the BTL-450 on or off, as well as to skip songs, control light modes and turn the volume up or down. You can also customise the audio by altering the levels of bass and treble with the remote, which is a nice addition to a budget tower speaker. Although the bass and treble levels only go from 1-4 (min-max), it's an impressive level of bass for such a small footprint. Overall, the sound quality of Lenco's tower speaker is very clear and punches above its weight for the £119 price tag (on Amazon, that is). As for the lighting, it'll be a case of personal preference as to whether you like it. Some may find it garish, but we think it adds a fun element to the BTL-450 speaker. There are three lighting modes, with the video below showing what we think is the most exciting one and a range of colours. 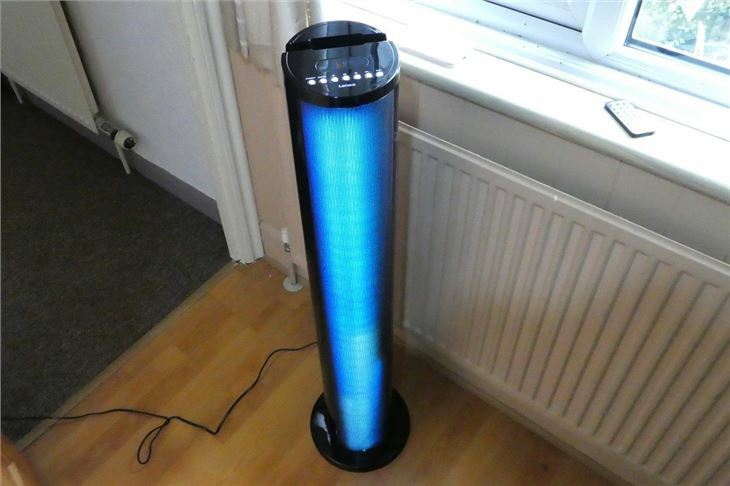 The other two lighting modes include the entire speaker's light column circling through one colour at a time, and the light column lighting up bit by bit vertically. There's also a built-in FM radio with auto-scan if you don't fancy any of your own music. 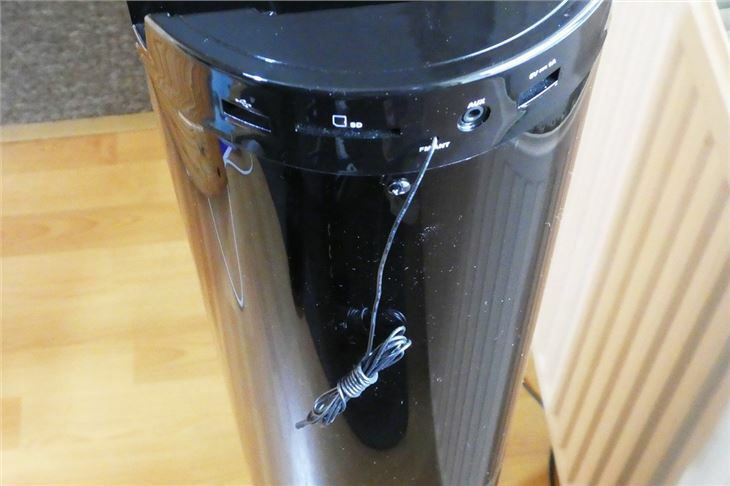 The radio recieves signal via a cable antenna that dangles at the back of the tower speaker, it works fine but doesn't exactly look pretty. Speaking of how it looks, the tower speaker is plastic, which isn't that surprising for this price. However, the plastic does make the Lenco feel a bit cheap, especially when we take a closer look at some of the speaker's details. The buttons, for example, are made of a light grey plastic and they make an unpleasant clicking noise when pressed. 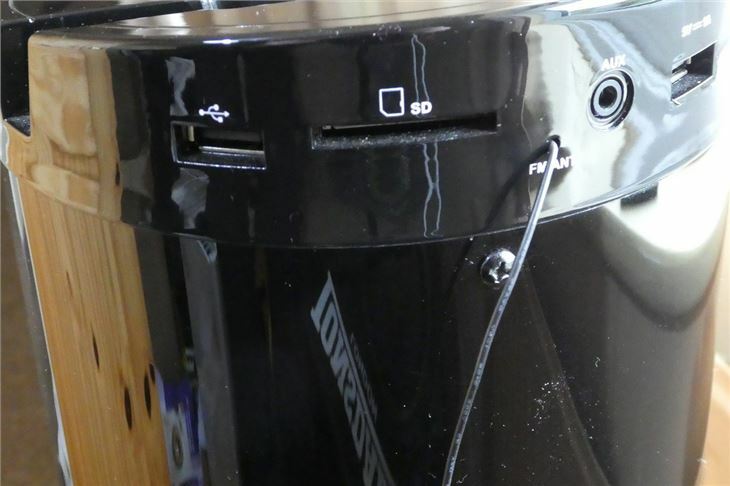 There's also a cutout section on top of the speaker that looks like a docking station. It looks big enough to fit most phones, our iPhone 8 fits fine, but it doesn't actually have a dock. 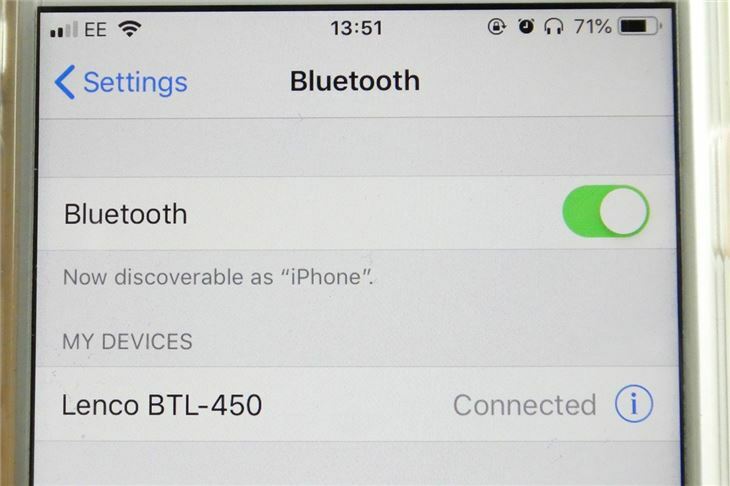 So your phone will sit in it, but it's not actually hooked up to the speaker, you'll still need to use Bluetooth. If you want to connect to the speaker via USB cable, your phone will only be able to sit in this fake-dock section sideways. If you have kids, or boisterous a dog in our case, the slightest knock risks your unsecured phone falling off the top. 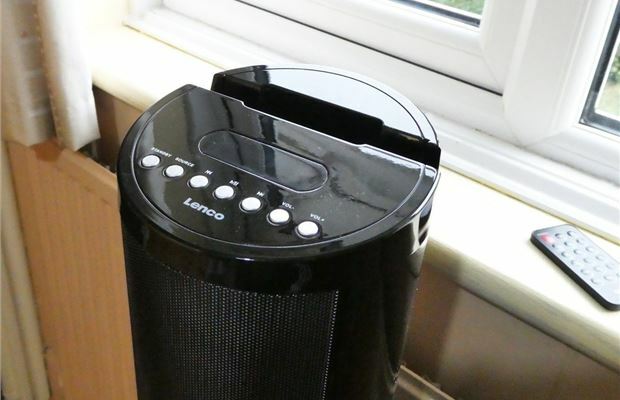 The Lenco BTL-450 is a very decent budget speaker, despite the name being a bit rubbish. It's mains powered so you're kind of restricted to where you keep it, but its small footprint means it takes up very little space and it's loud (and bright) enough to fill a room with sound. While there are possibly better value-for-money options, like the high-quality Yamaha NSF51 floorstanding speaker - which is £200, there isn't anything as fun as the Lenco tower speaker for this price.